My neighbors have questioned my sanity of late, asking what I’m doing in my backyard. 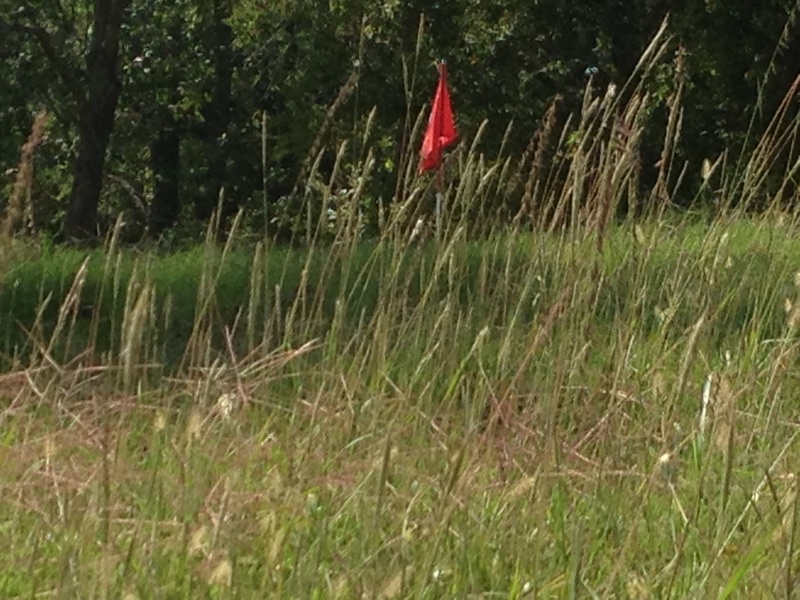 The short answer is that I’ve uncovered a golf course in the timber and hillside southeast of our home. The long answer is more complex. 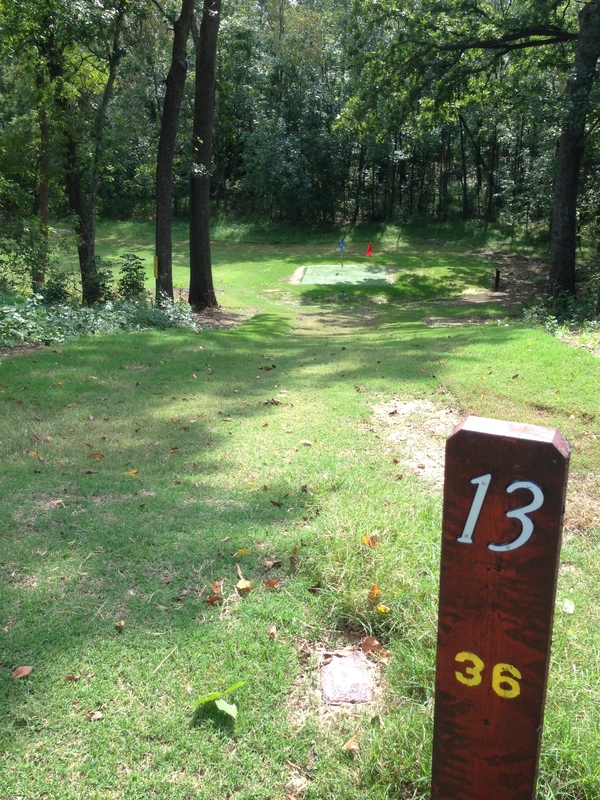 Perry Duke Maxwell lay dead and buried several hundred yards from where I stood waiting to hit a seven-iron from one of his famous elevated tee boxes at Dornick Hills Country Club in Ardmore, Oklahoma. Before hitting that shot, I walked to his grave to pay my respects. How poetic his netherworld perspective, his view of crisp golf shots and indifferent ones, that this ancient land once an Oklahoma dairy farm, he interpreted and shaped into a golf course. Now he lies in a state of sardonic observation, players flailing against his creation, from his cliff, his rising ground, the mound of earth he made famous by planting a golf green and tee atop. 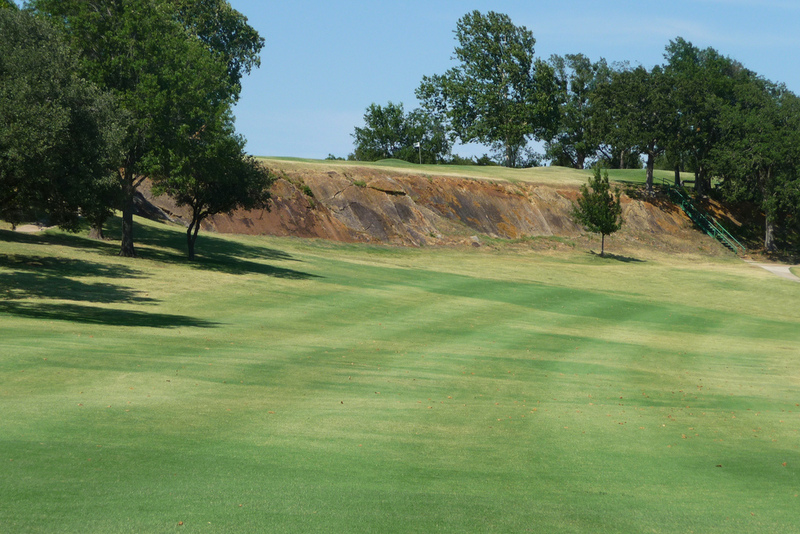 The 16th hole from the approach area of the fairway – Dornick Hills Country Club, Ardmore, Oklahoma This hill from which he watches the struggle now entombs him. And so I paid respect to the man who has so often challenged and tormented and inspired me. I strolled along the ridge on a secluded pathway overgrown with vines and prairie grass, to the grave of Perry Maxwell and stood with my hat in my hands. I built a golf course next to my house because I saw a vision through the dense wooded hills, perhaps a vision like that which drove Mr. Maxwell to carve up a dairy farm in Ardmore. It’s in my blood. Has been ever since childhood as I turned empty tin cans into golf cups pressed into the family lawn, cutting the greens with a Lawnboy mower. Mr. Maxwell has influenced much of my architectural formation as a homebuilder and as a golfer. Practical, minimal, utilizing existing topography, accentuating natural formations, curves and hills are beautiful, don’t avoid them. As I walked the fairways of Dornick Hills that day, enjoying the sweet aroma of bermuda clippings laying atop the fairways like confetti, a blanket of dew revealed the struggle of the golfer playing just ahead of me, footprints trailing into the left rough, then into the right front bunker, sand splashed on the green, the damp putting surface revealed the track of a ball breaking short and left of the hole, a two foot tap-in for a bogey five. This golfer had no secrets until the sun rose and burned away the revealing map of dew. Maxwell’s oaks are beautiful, arched limbs sifting sunlight like a colander, but beauty doesn’t diminish function on his courses. Oaks and maples are sentinels, keepers of the course, architectural pawns in the battle waged against warriors carrying fourteen clubs and multiple demons. 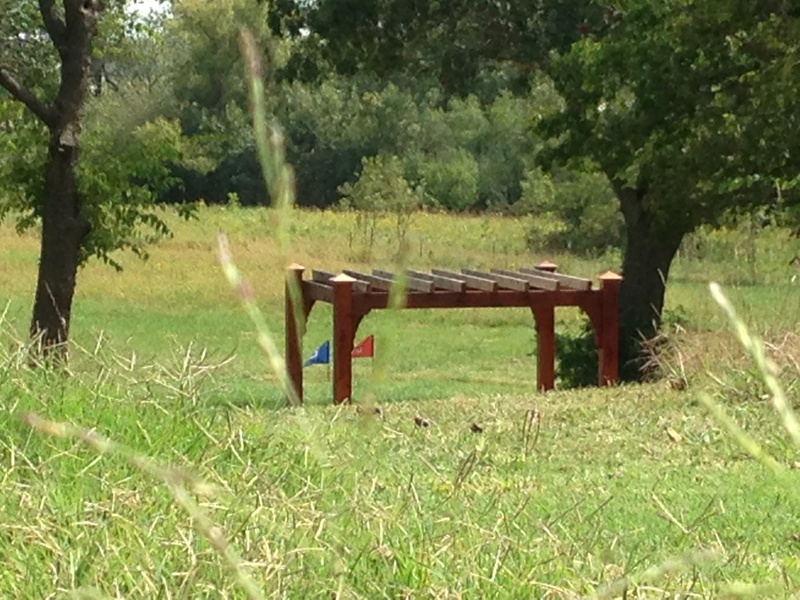 Natural elements along with architectural genius seek to deny my standard of excellence…par. Par is the mark of competence, the assurance that you have conquered this undulating, scheming terrain. And this? This verdant aromatic walk in the woods and over the hills? This is an altar upon which my athletic ego is sacrificed, doglegged fairways, subtle landing area, undulating greens, shaft-bending rough, sparkling water bubbling along stones in the brook…I’m home on a Perry Maxwell golf course. My creative muse calling me to build a golf course in my backyard, built most of the classic golf courses in Oklahoma in an era more famous for Dust Bowls and a Great Depression. Perry Duke Maxwell has his architectural fingerprints all over Hillcrest CC, Southern Hills CC, Muskogee CC, Ponca City CC, Prairie Dunes, Augusta National, Oklahoma City Country Club and Dornick Hills…even the front nine of Coffeyville, Kansas public course. I love his architectural style, utilizing existing topography while minimizing dirt movement. I saw a classic Maxwell miniature, rolling hills, elevation changes, greens with undulation…laying beneath the wooded hills southeast of my home. Mr. Maxwell’s layouts have been the ideal venue of my search for perfection. A quest for enlightenment in a round of golf, and if falling short of that high ideal, perhaps settling for a little self-awareness. An awareness of the euphoric peak of my athletic accomplishment and the valley of my failure. Walking the cross-cut fairways of Mr. Maxwell’s courses, I found a place of connection. Connection with my athletic and competitive self, but also with the parts of me still unnamed, the unsure, the noble, the possible. What can I accomplish? Am I becoming myself in measured advances of progress and retreat, exhilaration and despair, birdies followed by bogies? Or is this just an illusion of progress on a gilded green fairway? Bobby Jones once said that, “Golf is a game of considerable passion, either of the explosive type, or that which burns inwardly and sears the soul.” In either instance, I’m badly charred. Thanks, it does beat looking out at overgrown cedars and vines and poison ivy. Thanks for letting me put holes in the yard. Not sure I put the sod back when I was done!